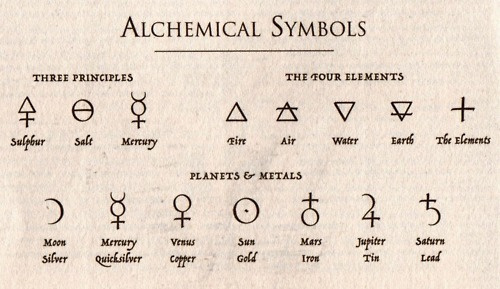 Alchemical symbols, originally devised as part of the protoscience of alchemy, were used to denote some elements and some compounds until the 18th century. Note that while notation like this was mostly standardized, style and symbol varied between alchemists, so this page of alchemy symbols lists the most common. The art of alchemy was handed down through the centuries from Egypt and Arabia to Greece and Rome, and finally to western and central Europe. The word is derived from the Arabian phrase "al-kimia," which refers to the preparation of the Stone or Elixir by the Egyptians. The Arabic root "kimia" comes from the Coptic "khem" that alluded to the fertile black soil of the Nile delta. Antimony-The metal antimony symbolizes the animal nature or wild spirit of man and nature, and it was often symbolized by the wolf. Arsenic was widely used by early alchemists and was also sometimes represented by the image of a swan. Bismuth-Although mentioned in alchemical texts it is uncertain what role Bismuth played in alchemical processes. Gold is one of the seven metals of alchemy (gold, silver, mercury, copper, lead, iron & tin). For the alchemist, it represented the perfection of all matter on any level, including that of the mind, spirit, and soul. The symbol for gold could also be used to represent the sun in astrology. Iron is one of the seven metals of alchemy (gold, silver, mercury, copper, lead, iron & tin). The symbol for iron could also be used to represent the planet Mars in astrology. Mercury, called quicksilver by the ancients was used to make red mercuric oxide by heating the element in a solution of nitric acid. The reaction of quicksilver in nitric acid is striking as a thick red vapor hovers over the surface and bright red crystals precipitate to the bottom. Alchemists were convinced that mercury transcended both the solid and liquid states, both earth and heaven, both life and death. Mercury is one of the seven metals of alchemy (gold, silver, mercury, copper, lead, iron & tin). The symbol for mercury could also be used to represent the planet of the same name in astrology. The metal is often also represented by a serpent or snake. Phosphorus-Alchemists often used light as a symbol of the spirit, therefore they were especially interested in light that seemed to be trapped in matter such as phosphorus. Platiunum-Alchemists believed platinum to be an amalgamation of gold and silver. Potash (potassium carbonate) was widely used in alchemical processes. Silver is one of the seven metals of alchemy (gold, silver, mercury, copper, lead, iron & tin). The symbol for silver is also associated wth the moon in astrology. Sulfur is one of the three heavenly substances (sulfur, mercury & salt). It was widely used in alchemical pratice. Tin is one of the seven metals of alchemy (gold, silver, mercury, copper, lead, iron & tin). The symbol for tin could also be used to represent the planet Jupiter in astrology. Zinc-Philosophers' wool, or nix alba (white snow) was zinc oxide made by burning zinc in air. Salt is the third heavenly substance in alchemy, the other two being Mercury and Sulphur. This mineral has been held sacred and been a prominent religious and social symbol since the very beginning of the human race. It is representative of friendship, brotherhood, incorruption and purity. It is symbolic of the good things in life and also represents wit and sarcasm.